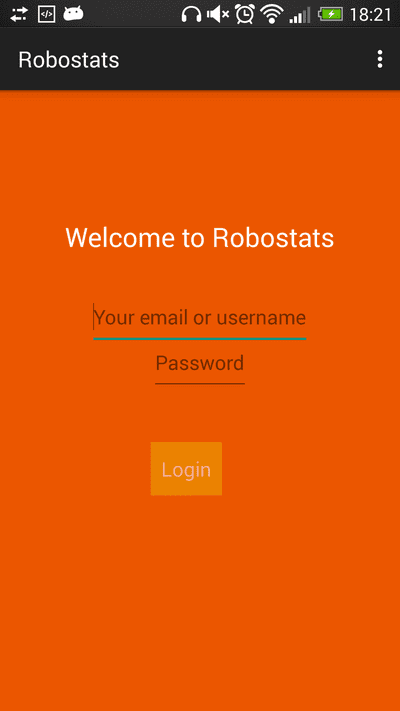 Robostats is a platform to gather and display statistics for robots and other connected devices. Robotstats is a platform to gather and display statistics for robots and other connected devices. 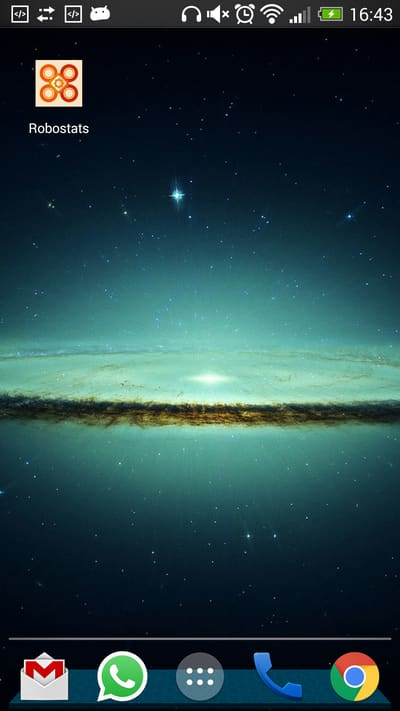 Robostats can also be used as a remote control to send signals to connected devices of the same kind, when a device receives this signal it can alter its behaviour and provide feedback. You may see a development preview at dev.robostats.io. Use user@example.com / pass to enter, we didn't have any security precautions, so please don't hack us :-). 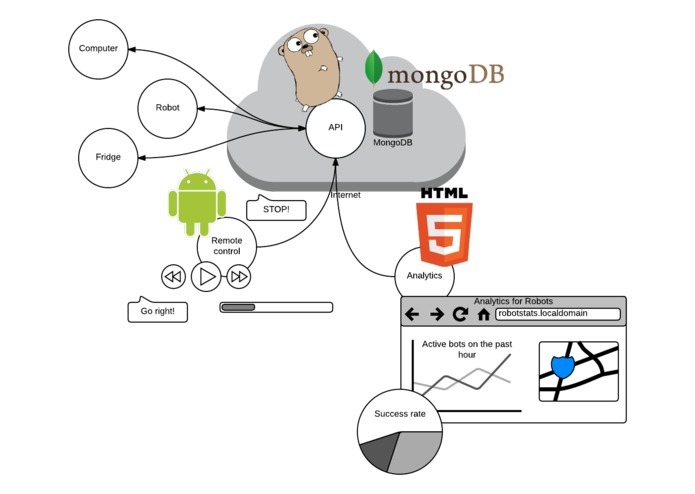 The Robostats API provides tools for creating categories for your devices (or robot classes). 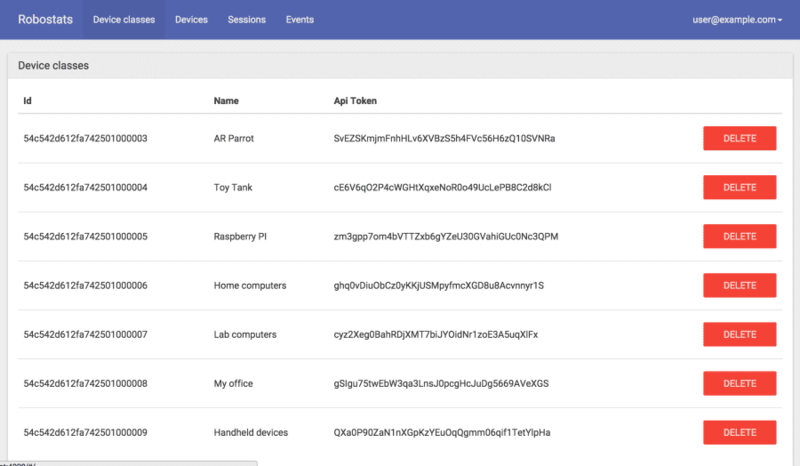 Each class has its own API key, connected devices can use this API key to register themselves (as a robot instance). 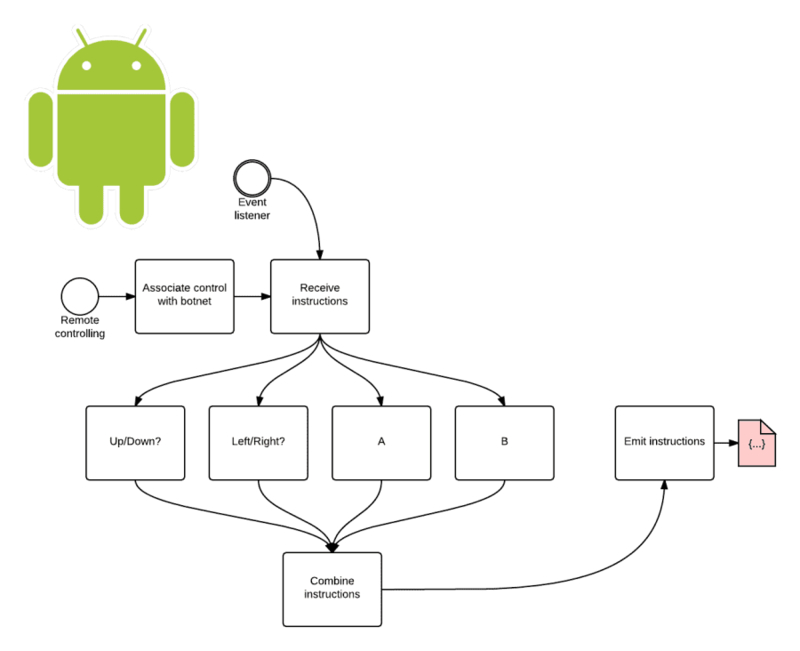 A robot instance must create a session before adding events, a session is like a bucket to store actual device logs. 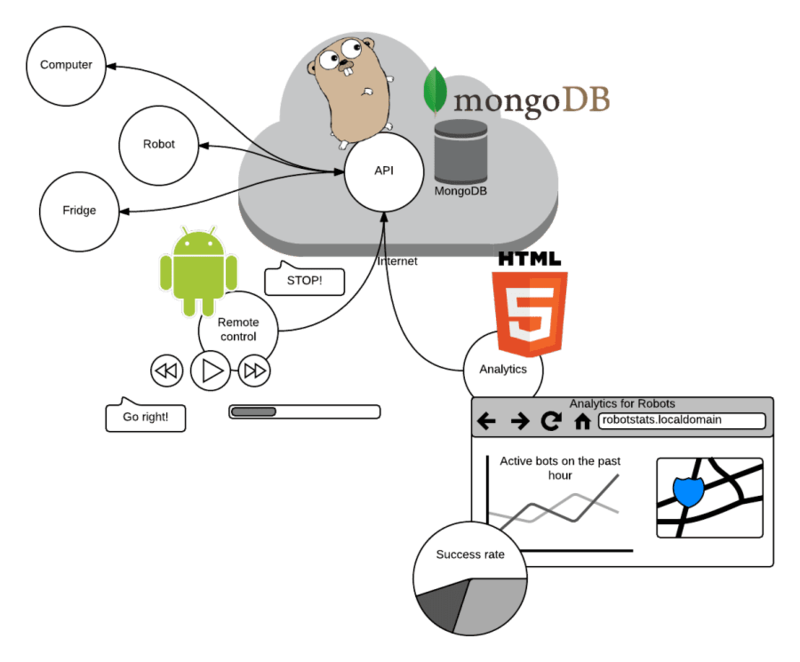 Different devices may produce different events and event values, that's why we use MongoDB as permanent storage, its ability to save schemaless documents can be used to store many different kinds of logs. There is also a client package for Robostats that can be used as an example to communicate with the API. The analytics panel provides an overview of all registered devices, organized by it's class. 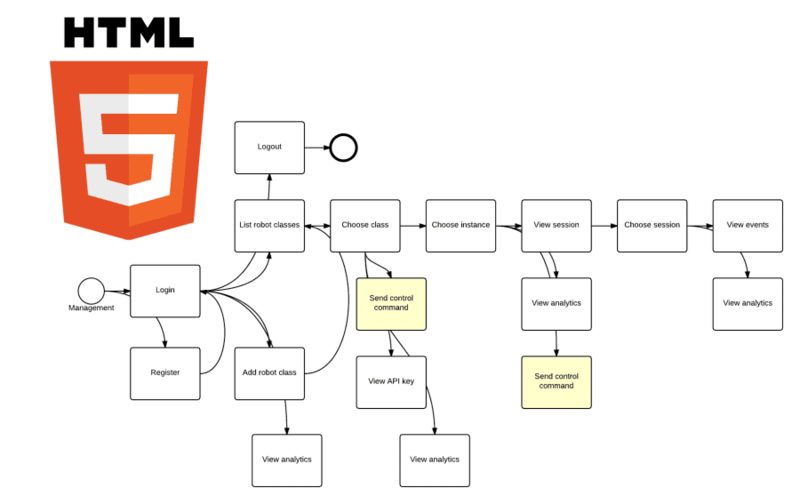 It allows users to register new device classes and get the generated api key for each class. Selecting a device class users can drill down to a specific device, it's session (any period of activity) and finally, to a graph that shows all the events generated from that drone in a particular sesion. 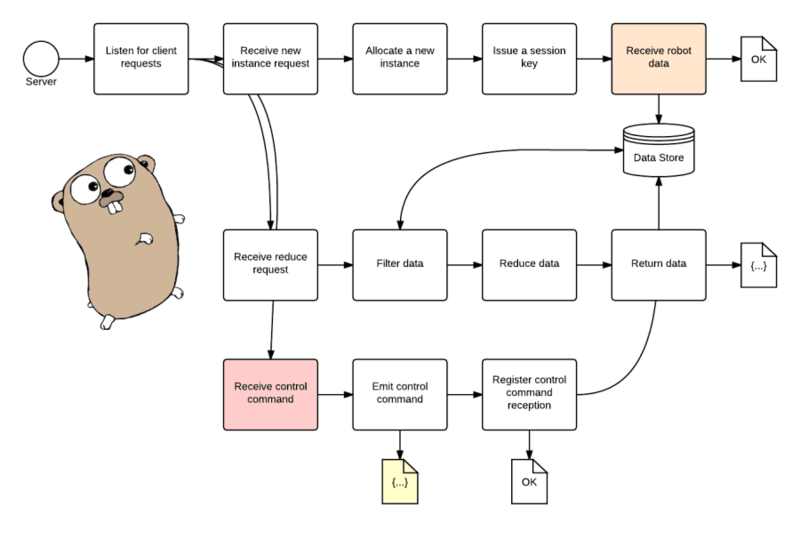 The remove control as not finished on time, we left it here as a reference for future implementation. The remote control is an application for Robostats that can be used to send signals to connected devices. Robostats only acts as a distribution hub for these commands. 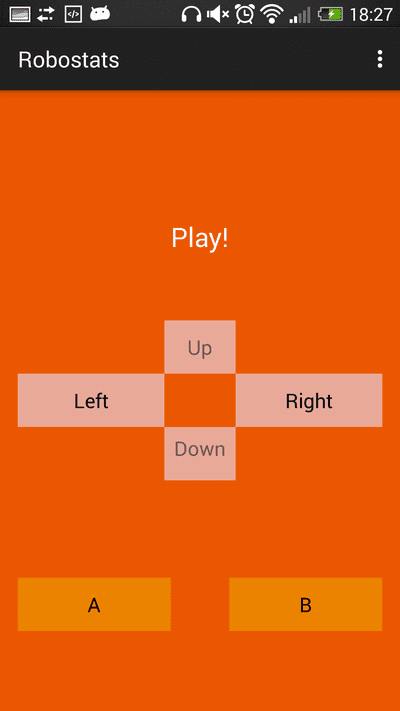 The WIP implementation of the remote controller was an Android app. You could use the app to log in into your account. Using the remote control, you could choose a device class and send commands to all connected instances. These commands could vary, but we we're playing with a standard game-like pad. Copyright 2015. The robostats authors.